Holy Baptism is the first of seven Sacraments in the Orthodox Christian Church. Together with the Sacrament of Holy Chrism it joins the candidate to the Mystical Body of Christ, the Church. Some people argue that the only valid baptism is that of an adult who believes in Christ first. They argue that to baptise a helpless infant only a few weeks old who is unable to believe is meaningless. So why baptise a baby when it doesn't know yet what is happening? Why not wait for the baby to grow and believe in Christ and ask for baptism? If we were to follow this line of reasoning, we wouldnt inoculate the baby against diphtheria until he grows up and asks for it! But we know better. Baptising infants before they know what is going on is an expression of God's great love for us. It shows that God loves us and accepts us before we can ever know and love Him. It shows that we are wanted and loved by God from the very moment of our birth. Nothing shows the nature of God's grace more than infant baptism. The Orthodox Church does not belittle personal faith in an adult who seeks baptism, but instead insists that the whole emphasis of baptism is not an what the baby does or the parents or the godparents, but on what God does. The fact that we are Christians is not due to any act on our part; it is due to the act of God in Christ through the Holy Spirit. Of course Baptism demands a personal response on the part of the baptised child when it reaches the age of reason. The child must accept what God did for him or her in Baptism. Baptism is not a divine pass that will get us into Heaven automatically. It must be followed by a personal awareness or awakening to the many gifts of God's love bestowed upon us through this great sacrament. It was the Lord Jesus who instituted Baptism. "He who believes and is baptised will be saved" (Mark 16:16). "Go therefore and make disciples of all nations, baptising them in the name of the Father and of the Son and of the Holy Spirit..." (Matthew 28:19). "Truly. truly, I say to you, unless one is born of water and the Spirit, he cannot enter the kingdom of God" (John 3:5). The great model of our baptism, then, is the baptism of Jesus in the River Jordan. To remove the consequences of the 'original sin'. To wash away all other sins committed before the time of Baptism if the person is beyond the age of infancy. To unite the person to "The Body of Christ" (that is, the Church), and to open the door of salvation and eternal life to him or her. 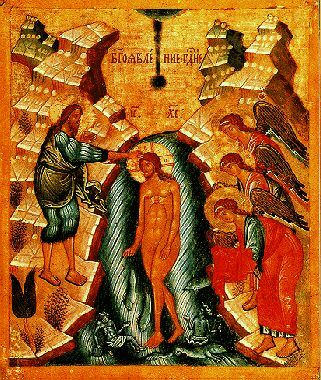 The many gestures involved in the performance of the Sacrament of Baptism in the Orthodox Church are not mere forms devoid of meaning. Christianity is life. Each action in the Sacrament of Baptism expresses what Christ is actually doing for us through this Sacrament. The use of sponsors in Baptism dates back to the days when Christians were persecuted by the Roman Emperor Nero. Parents were often massacred during these persecutions. Thus sponsors were provided to instruct the children in the Christian faith in the event the parents were martyred. The godparent promises to see to it that the child is raised and educated in the Orthodox Christian faith. For this reason, it is important that godparents be chosen not for social reasons, but because they are persons who love God and His Church. Sponsors must be Orthodox Christians in good standing with the Church, otherwise they will not be able to bring up the child in a faith that is not theirs. "Do you renounce Satan, and all his angels, and all his works, and all his services. and all his pride?" "Do you unite yourself to Christ!" The renunciation of Satan and the union with Christ express our faith that the newly-baptised child has been transferred from one master to another, from Satan to Christ, from death to life. The priest then makes the sign of the cross on the child's body. This is repeated often during the service. Essentially the cross is the sign of victory which puts the devil to flight. In the old days slaves were branded, as are animals today, to show to what master they belonged. Today the sign of the cross brands us as belonging to Christ. The godparent is then asked to confess faith in Christ in behalf of the infant and reads the confession of faith contained in the Nicene Creed. The Creed was a symbol or sign of recognition among the early Christians; it was like a password that distinguished the true members of God's family. By reading the Creed the godparent confesses the true faith that will be passed on to the infant in time. through Holy Baptism. In addition to our own individual name each person receives the name "Christian" at Baptism. From that moment on we bear the name of Christ. However dark may be the night that surrounds us, Baptism remains the sacrament of entrance into light. It opens the eyes of the soul to see Christ, the light; of the world (John 1:19) It makes us sons of light (1 Thess. 5:5). In the early Church the baptismal candle was always kept by the one baptised and brought to Church for major events in the persons life. Even as the final hour of life approached it was lighted again as the soul went forth to meet its Judge. It was a constant reminder for the Christian to live and die by the light of Christ. Thus the candle becomes a symbol of the perseverance of the baptised soul until Christ's return. The baptismal font in the language of the Church Fathers is the Divine Womb whence we receive the second birth as children of God. Baptism is truly a birth. "But to all who received him, who believed in his name, he gave power to become children of God; who were born, not of blood, nor of the will of the flesh, nor of the will of man, but of God" (John 1:12-13). When a person is Baptised, they descend into the baptismal font. As the water closes over the head, it is like being buried in a grave. When the newly baptised emerges from the water, it is like rising from the grave. Baptism represents our old, sinful nature dying and then being resurrected again by Christ in a new and cleansed form. As St. Paul says, "Do you not know that all of us who have been baptised into Christ Jesus were baptised into his death. We were buried therefore with him by baptism into death, so that as Christ was raised from the dead by the glory of the Father we, too, might walk in newness of life" (Romans 6:3-4). Do You Yourself, O loving King, be present now also through the descent of Your Holy Spirit and hallow this water. Let all adverse powers be crushed beneath the signing of Your most precious Cross. The infant is baptised in its naked state to denote that just as we came out of our mother's womb naked so we emerge naked out of the womb of God -- the baptismal Font. The removal of all clothes also signifies the putting off of the old man which will be cast off entirely through Baptism. Olive oil is blessed by the Priest and then applied by him to the child's forehead, breast, back, hands, feet, ears, mouth, in order to dedicate them to the service of Christ. The godparent then covers the entire body of the infant with olive oil in order to express our prayer that with Christ's help the infant may be able to elude the grip of sin and the evil one. The servant of God (name) is baptised in the name of the Father. Amen. And of the Son, Amen. And of the Holy Spirit, Amen. At each invocation the Priest immerses and then raises the infant up again. After the Baptism the Priest places the child in a new linen sheet held by the Godparent. the seal of the gift of the Holy Spirit, Amen. The whole man is now made the temple of God and the whole body is consecrated to the service of God. According to Orthodox belief every baptised lay person is consecrated by this Sacrament; he receives the gift of the Holy Spirit to become a deputy or an ambassador for Christ in this world. Clothed is the servant of God (name) with the garment of righteousness, in the Name of the Father, and of the Son, and of the Holy Spirit, Amen. "For as many of you as have been baptised in Christ, have put on Christ" (Galatians 3:26-27). "Therefore, if any one is in Christ, he is a newcreation; the old has passed away, behold the new has come" (2 Corinthians 5:17). As many of you as have been baptised into Christ, have put on Christ. Alleluia (Galatians 3:27). This reflects the belief that at this moment the angels in heaven are expressing their joy that a new soul is registered in the Book of Life. Tradition states that at this moment God assigns a guardian angel to stay with the newly-baptised person until the end of their earthly life. Following the reading from St Pauls Epistle to the Romans (6:3-11) and the Reading from the Holy Gospel (Matt. 28:16-20) the Priest says to the child, You are baptised; you are illuminated; you are anointed with the Holy Myrrh; you are hallowed; you are washed clean, in the Name of the Father, and of the Son, and of the Holy Spirit. Amen. The Priest cuts four locks of hair from the child's head in the form of a Cross. This is an expression of gratitude from the child, who having received an abundance of blessings through the Sacraments of Baptism and Chrismation and having nothing to give to God in return, offers part of its hair, as a first-offering to God. In the Old Testament, hair is seen as a symbol of strength. The child, therefore, promises to serve God with all its strength. Immediately following Baptism and Chrismation the neophyte becomes a full member of the Orthodox Church. As such, the child is now entitled to receive the precious Body and Blood of Christ in the Sacrament of Holy Communion (or Holy Eucharist). The new life in Christ, given in Baptism, is renewed again and again in the Eucharist. As nature provides milk for the nourishment of the infant after birth, so God provides Holy Communion for the infant immediately following Baptism in order to provide nourishment for the spiritual life the neophyte has received through Baptism. Summarising what God does for us in Baptism we may say that first it tells us who we are. We are God's children. We are loved by Him from the very moment of birth when He takes us into His arms and bestows upon us the kiss of His love through Baptism, Chrismation and the Eucharist. He makes us heirs of His riches. Thus, our existence is not like that of worms that exist for a short time until someone steps on them and crushes them into oblivion. We are not "nobodies" for whom no one cares. We are "somebodies" for whom the Supreme King of the universe cares enough to call us His own sons and daughters! And at the end of our brief pilgrimage through this world, He will address each one of us personally, by our Baptism name, and say, "Come, my son or daughter (name), inherit the kingdom prepared for you from the foundation of the world". This we know for certain because we have been baptised in His name. "The Sacraments of the Orthodox Church", Greek Orthodox Archdiocese of America.